on the growth and efficiency of your practice. This lecture was part of a new conference, Mastering Advances in Dermatology: Beyond Skin Deep, which was held in Greensboro, NC on 3/31-4/1/2012. The goal of the conference was to provide increased knowledge for the practicing dermatologist, as well as residents and fellows, by presenting the latest information in a succinct manner on key areas of medical dermatology such as malignancies, acne, infectious disease, psoriasis, pediatric dermatology and OTC agents. In addition, an aesthetic workshop that discussed facial injectable products with live patient demonstrations was offered. 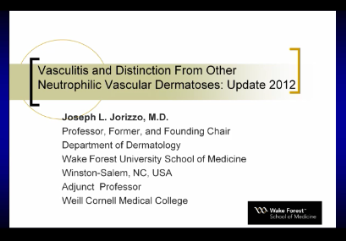 In this lecture, meeting Chairman, Joseph Jorizzo, is discussing Vasculitis and Distinction From Other Neutrophilic Vascular Dermatoses: Update 2012. For more information about the 2nd Annual Meeting, being held April 20-21, 2013 in Raleigh, NC, please go to: www.x-Medica.com/BeyondSkinDeep. This demonstration was part of the Advances in Aesthetics, A Multispecialty Approach to New and Emerging Technologies (Part 2) Forum presented on Saturday, June 9, 2012 as part of the 8th Annual Vegas Cosmetic Surgery 2012 Meeting in Las Vegas, NV. This video demonstration features Dr. Rebecca Fitzgerald, Dermatologist in Private Practice in Los Angeles, CA and Dr Hema Sundaram, Dermatologist in Private Practice in Rockville, MD. Thank you to DermaSculpt for supporting this educational workshop.